The fate that befell one of America’s most expensive drones in 2011 just goes to show that sophisticated military technology is not immune to damage. 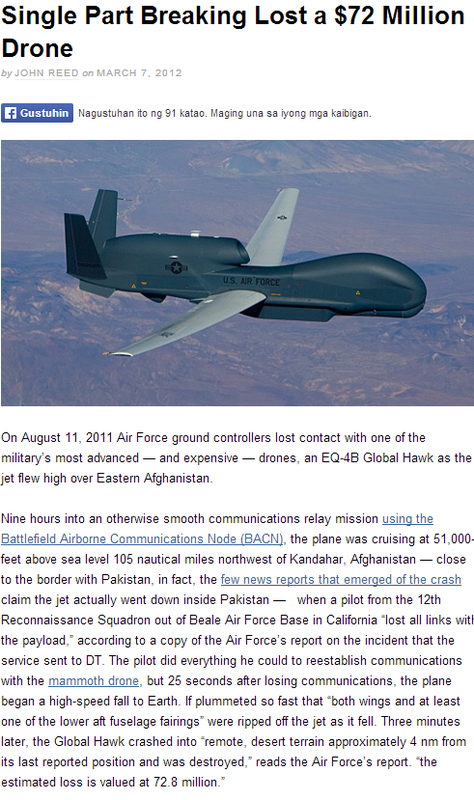 During a routine patrol close to the Afghan-Pakistan border, an EQ-4B Global Hawk drone cut out from its remote control and went down a hundred miles northwest of Kandahar. An inquiry into the incident by Air Combat Command found a disconnected module inside the drone as the cause of the crash, which was eventually traced to loose fasteners. If you think about it, it’s not just aircraft that is being held by a bunch of screws, nuts, and bolts. From the car you drive to the office lift you ride, the safety of users depends on metal fasteners holding their own in any condition. A single improperly torqued or screwed fastener could mean disaster for the whole structure or system. According to experts, it’s usually the simple problems that lead to complex disasters such as the Global Hawk crash. Doug Lescarbeau, anaerobic technology director for Henkel’s Loctite line of adhesives, writes that the two most common reasons for threaded fastener failure are corrosion and inadequate clamp force. Inadequate clamp force, in this case, doesn’t only mean a loose fit but also an unnecessarily tight one. Just as a loose torque can come undone with the slightest application of stress, excessive torque can succumb to stress and, consequently, break apart. The required amount of clamp force necessary depends on various factors including the size of the fastener. Corrosion, namely galvanic corrosion, occurs when anodic and cathodic metals make contact. Engineers always take into consideration the right match of metals for use in projects big and small. For example, it’s common for roofing contractors to use hot-dipped fasteners, steel fasteners dipped in molten zinc, and for installing roofing materials close to the galvanic scale. Despite acknowledgment of any structural failure, it can’t be a learning experience for engineers without testing the failure itself. Root cause analysis, Lescarbeau writes, can identify the failure but not the cause and must be followed by exhaustive testing courtesy of a fastener consulting company such as GT Technical Consultants. By knowing the possible reason for failure, engineers can react accordingly and prevent similar mistakes in future projects by taking the appropriate action. What befell the drone, after all, can happen to virtually anything. Guy Avellon has written 4 post in this blog.